A crunch of snow beneath the tires as you pull into the last parking spot for miles, narrowly edging out a gleaming SUV with a driver who seems to be trying to express that you’re…number one? Eyelids narrow to slits and you tuck head to chin, bracing against icy gusts as you make for a battery of persuasive, brightly-lit store windows. It’s a full week before Christmas–look at you, all on top of the situation, with a carefully considered list of gifts to buy buried in your parka. No eleventh-hour frenzy this year. Tiny platoons of chattering children curl the corners of your frosty lips skyward as the soothing aromas of mulling spices and candied confections drift past. An infinity of sparkling lights showering the trees stirs something inside you. Something lovely, and pure, and radiant. AN EAR-GOUGING MIDI PERVERSION OF A CHRISTMAS CLASSIC THAT TRIPS A WIRE IN YOUR BRAIN, MANCHURIAN-CANDIDATE-ING YOU INTO AN ARSONIST RAGE BEFORE YOU’RE CARTED OFF TO THE STATE PENITENTIARY. Which is why I am so grateful that this album you’re holding in your hands–or unforgivably streaming on YouTube–exists. Despite my own unwavering love of this holiday, it does seem that the recording industry is hell-bent on chipping away at that love with a yearly onslaught of cloying, and largely redundant, Christmas-themed releases. Imagine Christmas is my antidote. A single album that somehow balances out the fluff that’s no doubt headed our way this, and every, season. You will be aware of three striking elements on this record, from the minute you press play. The first is the quality of the performances. These are top-level musicians bringing their same superlative artistry to Christmas favorites that they do to a Schubert quartet or Taverner score. The second is the sterling quality of the recording. 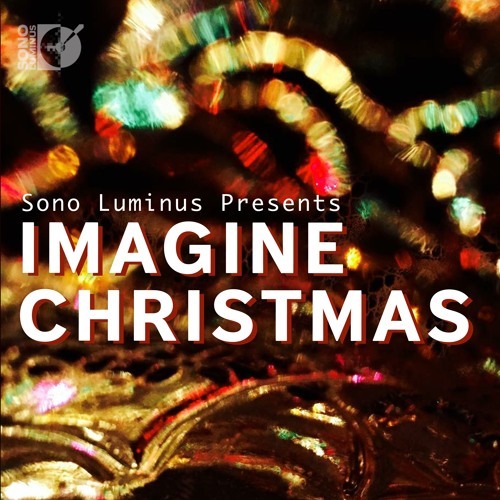 If there is a sonic equivalent to sipping a hot toddy while curled up before a roaring fire, it is Sono Luminus’s peerless mixes and captures. Third–and in every way as essential as the previous two–this is a kaleidoscopic collection of styles and interpretations of beloved songs and carols that keeps me eager for the next number. If you’re like me, four tracks in to just about any single artist’s Christmas album, I am ready to move on. With such a fetching variety of artists and approaches, I find myself going top-to-tail on this one. Simplicity is an underrated avenue when it comes to holiday releases, so the entries by Irina Muresanu & Matei Varga, Bruce Levingston, Kathryn Bates, and Skylark Vocal Ensemble are a breath of proverbial fresh air. Muresanu’s seductive playing is a glimpse into the golden age of violin technique–lush vibrato and delicious sentimentality, which infuses “White Christmas” with every bit of nostalgia one could hope for. One can imagine twirling 19th century gowns in Levingston’s solo piano rendition of Tchaikovsky’s “Christmas,” with frictionless phrasing that plays like freshly sharpened skates on virgin ice. Heading over to cellist Kathryn Bates’s reimagining of “Santa Claus is Coming to Town,” we are tucked into a bed of extravagant resonance, spinning arpeggios, and all the anticipation and delightful impatience of a child for whom morning cannot arrive soon enough. And of course, Skylark. I’ve still got their devastatingly gorgeous album Crossing Over in regular rotation, and with “Have Yourself a Merry Little Christmas,” this chamber choir presents an intoxicating wistfulness that will find the listener awaking to find herself gazing out an ice-encrusted window when the final notes fade. Speaking of nostalgia, is there any more transportive Christmas number than Vince Guaraldi’s “Christmas Time Is Here?” Pianist Caleb Nei here manages to sensitively preserve the graceful melancholy of the original while animating and refreshing the pace of this cherished tune. Given Sono Luminus’s catholic–no, not that Catholic, the other one–appetite for divergent stylistic flavors, we should probably have seen the astonishment that is Cuarteto Latinoamericano’s “Joy to the World” coming from a distance. Chirping grooves concocted by twitching bow hair behind the bridge send us off in an altogether more festive direction. Or take the scurrying interior lines and expansive tessitura of pianist Stewart Goodyear’s “Good King Wenceslas Variations,” a piece that conjures up sonic impressions of dauntless backup vocalists carving out the harmonies. Coursing us back into the especially rich Christmas territory of the folk traditions are lute luminary Ron McFarlane and the bewitching celtic collective of Ensemble Galilei. The former’s “Walking in the Air” is a go-to, non-pharmaceutical, elixir perfect for when things get a bit hairy with the in-laws this December, and the latter’s “Frosty the Snowman” is like devouring an entire Buche de Noel, with none of the regret or need to go up a pant size. The departure that is Cory Hills’s spoken-word “Twas the Night Before Christmas” brings a welcome charm to the track list, his spirited delivery illuminating and exploding the text with a concise cluster of percussion. With the multiplicity of sounds offered on this record, any listener is bound to point to a favorite. For this listener, that arrives with the final selection, ACME’s “Silent Night Drone.” Perhaps the furthest distance from what we might think of as “Christmas music,” this meditation on one of the season’s most stirring melodies is simply ravishing. Imagine a Christmas in which every carol is this inspired. More accurately, playing this album will not induce the brand of gut-busting, teary-eyed revelry that an episode of Chappelle’s Show or a YouTube clip of Anna Karkowska’s vibrato will. It is funny like the idea of a Rothko turning the stomachs of well-heeled gluttons at the Four Seasons is funny, or how anything Andy Kaufman ever suited up for is funny. It might be a little uncomfortable, rings clear in its truth, and sometimes reveals itself gradually. With eyes closed, chin tilting toward the peeling paint on the ceiling, he whips his hands outward with a velocity suggesting the presence of an adversary eager to out-draw him. The bandoneon surges to life, its bellows gasping in a lungful of air like a man nearly drowned. He careens between tightly-coiled chord clusters before shooting a nod to the string quartet, and all five hurtle forward in a taut rhythmic unison. As you take your seat, a chilled glass frosting your fingertips, you notice first that these chairs form a tight circle around the four stands at the center. Instruments are shouldered and the music unfurls. You are in the chamber with Spektral Quartet. It is a place of great intimacy, where eye contact between musician and listener is inevitable. The breath of the players is audible, their furtive exchange of smiles and smirks, unconcealed. The composer is, undoubtedly, sitting nearby. It is an inviting place, a shared space where sound is immersive. Watching Rebekah Heller dominate a stage and transfix an audience, it comes as no surprise that new vehicles for her virtuosity would be swiftly exhausted. Rebekah is not simply an instrumentalist. She is a red-blooded performer. There is an audacity in her approach to the bassoon that finds a parallel in a project as brazen as constructing a new wing on the bassoon library. This is not a single commission sandwiched into a recital, but five compositional roundhouse kicks carving out real estate in the new music canon.